Description: All-you-can-eat buffet with live cooking stations with foods from China, Thailand, India and Italy. Reason for visit: I'd been to a Jodi Picoult book reading and Q&A nearby and we didn't know the area, and thought the place looked nice with a good choice of food. 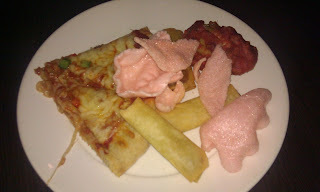 We ate: all sorts as I wanted to try lots of different things from the buffet. The food was: mediocre at best. 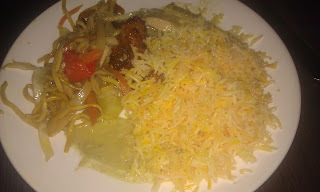 Some dishes were quite tasty, like the almond chicken curry; others were quite disappointing like some sort of Chinese style fish and a noodles dish. The pizza was actually very good. But the dishes were fairly random and it didn't seem like they had everything that you might think would go together. For instance, there was no rice in the Chinese food section and the only kind they had was Indian pilau rice; there were prawns crackers but across the other side of the room and they were pink, and there was no sort of dipping sauce that would have been nice to have with the spring rolls. 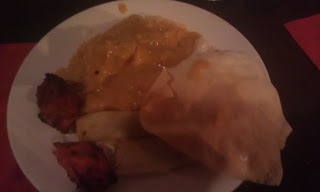 It would have been nice to have naan bread to go with the Indian curries too. 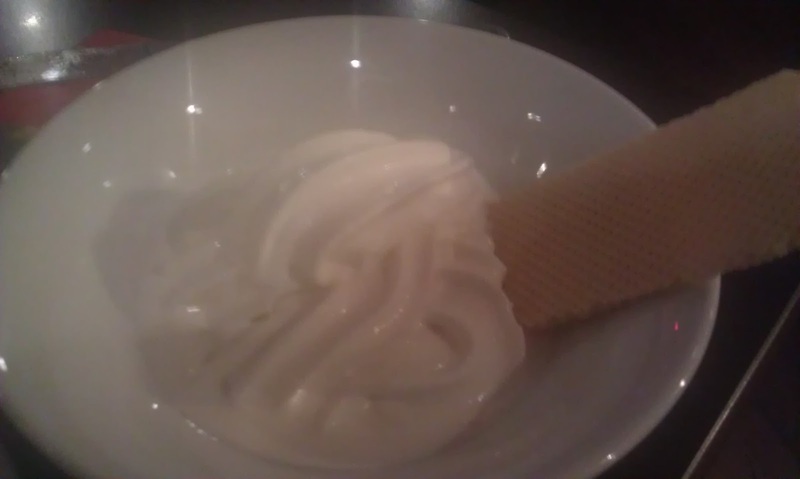 The desserts were very disappointing; it looked like there was a good selection until I looked more closely. 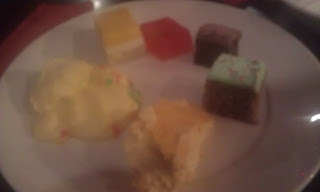 There were about three kinds if cake with icing on top cut into tiny cubes, which just tasted dry and dull. Then there was mango mousse (quite nice) and mango creme brulee (not so nice) and an ice cream machine but no sauce or sprinkles to go on the ice cream. Everything was really quite plain and didn't look like it had had a lot of thought put into it. 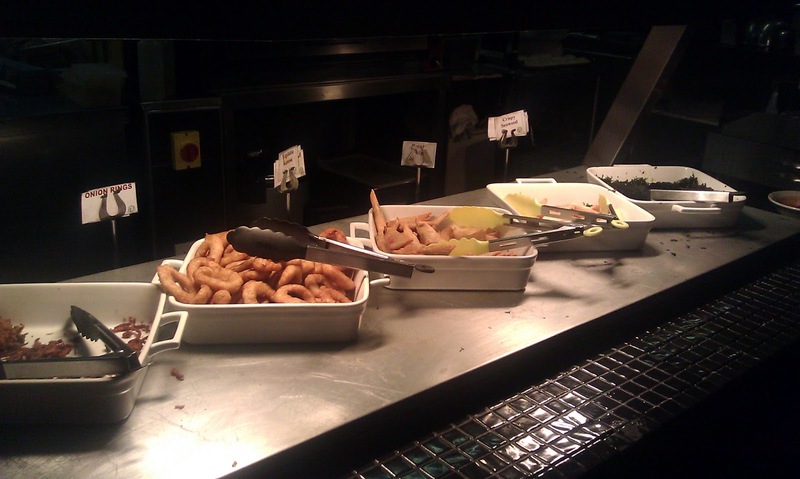 The atmosphere/service was: Our waitress showed us to a table, asked if we had been there before, as she was presumably about to explain how the buffet worked, then saw some more customers come in, and literally left us mid-sentence to go and show them to a table. I imagine she was overworked and didn't want to keep them waiting in the doorway but it seemed very rude and we weren't sure if she was going to come back to our table (she eventually did) or if we should just start helping ourselves to the buffet. After we had finished eating, we were chatting as we finished our drinks and I noticed three waiters had lined up alongside the bar just in front of us and were watching us, making me feel like they were waiting for us to leave. About ten minutes later we had and paid our bill but were still chatting when one came over and said "You have to leave, we are closing now." Fair enough, it was 10.30 on a weeknight... but as we walked out past other tables, several people were still eating. I felt like we had been thrown out because we obviously weren't going to order any more food or drink so weren't going to give any more money to the restaurant - and it wasn't like they were busy and needed the table. As we'd paid the bill we were clearly about to leave soon so I didn't appreciate being asked to leave. Price range/value for money: £14.99 for all you can eat at dinner, so you could certainly get your money's worth and more. Would I recommend it? No, the food wasn't that good and the service quite unfriendly. It might suit big groups where people want different types of food but I wouldn't personally go back here. good price,mediocre food,very bad service,wouldn't go there again if i were you!! !